Located in Duck, Kill Devil Hills and Buxton, daily and weekly rates available for bicycles for all ages, beach equipment, kayaks, surf boards, skim boards, body boards and SUP’s. 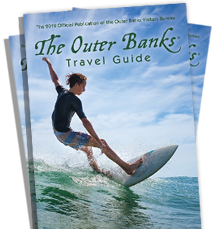 In addition we provide Surf and SUP Lessons and Tours along the Outer Banks. Just added: a 3 hour biking tour from historic Kitty Hawk Village to the Wright Brothers National Memorial. Call our Kill Devil Hills office or visit our website for more information.